Canada will sign the Trans-Pacific Partnership (TPP) deal next week along with 11 other countries, confirmed Chrystia Freeland, Minister of International Trade, in a statement released Monday. However, Freeland also stated, “signing does not equal ratifying,” saying it had yet to be voted on in Parliament to take effect. The deal, which will open up trade between signatory countries, has drawn controversy from some industries. Dairy farmers from across Quebec and Ontario gathered to protest against the deal on Sept. 29 2015 at Parliament Hill, blocking off traffic along Wellington Street. 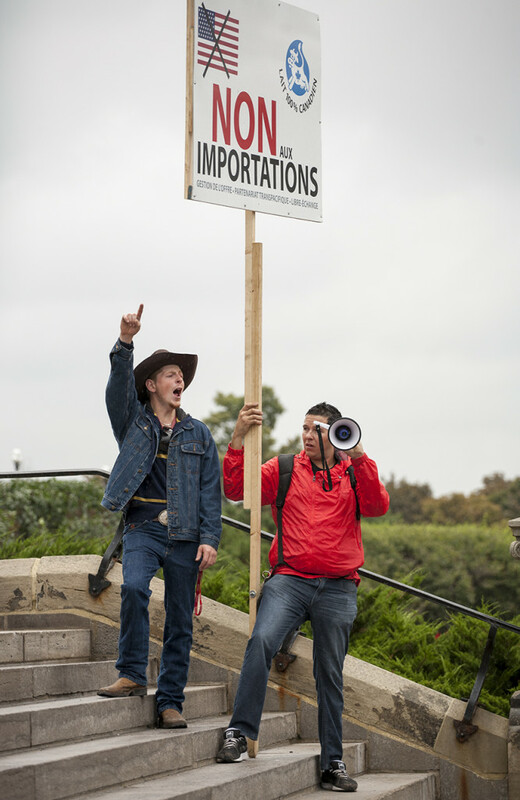 Canadian dairy farmers protest the Trans-Pacific Partnership (TPP) on the step of Parliament Hill. Sept. 29 2015.